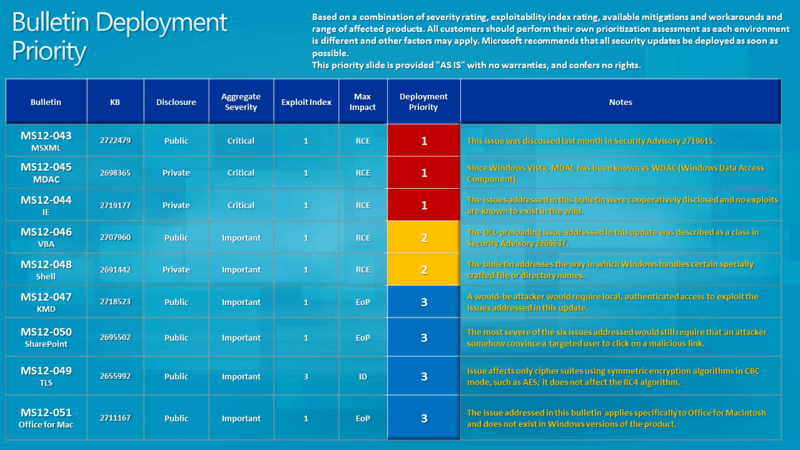 Microsoft has issued nine security bulletins as advanced bulletin notification for July 2012 Patch Tuesday. The nine security bulletins fixes 16 issues in the Windows operating system, Internet Explorer, Visual Basic for Applications, and Microsoft Office. Out of the nine security bulletins of July 2012 Patch Tuesday, Microsoft has rated three of the security bulletins; MS12-043 (Microsoft XML Core Services), MS12-045 (Microsoft Data Access Components ), MS12-044 (Internet Explorer), as critical. The remaining six, MS12-046, MS12-048, MS12-047, MS12-049, MS12-050 and MS12-051 as important. Almost all the patches except one will need a system restart. This security update resolves a publicly disclosed vulnerability in Microsoft XML Core Services. The vulnerability could allow remote code execution if a user views a specially crafted webpage using Internet Explorer. An attacker would have no way to force users to visit such a website. Instead, an attacker would have to convince users to visit the website, typically by getting them to click a link in an email message or Instant Messenger message that takes the user to the attacker’s website. One of the three critical patches will address a vulnerability that affects both Windows and Internet Explorer 9. The other two critical bulletins could allow malicious users to remotely execute code on the Windows operating system. Marcus Carey says, “Many are expecting a patch for CVE-2012-1889: a vulnerability in Microsoft XML Core Services, which is currently being exploited in the wild.” But, from the advanced bulletin notification, it’s still not clear if the CVE-2012-1889 issue will be addressed in the July 2012 Patch Tuesday release. Coming to the six bulletins of July 2012 Patch Tuesday, rated as important, two of the bulletins patch issues in Remote Code Execution, one affecting Microsoft Office and Microsoft Developer Tools, and the other found in Windows. The next three bulletins rated important patches vulnerabilities that could have resulted in Elevation of Privilege. These bulletins addresses the issue found in Windows, Office, and Microsoft Server Software. The last bulletin, which is rated important, patches a hole in Windows that might have resulted in Information Disclosure. If you have never heard about “Patch Tuesday,” Microsoft issues monthly security updates the second Tuesday of every month. July 2012’s Patch Tuesday will be no different. Watch the video below for an overview of this month’s bulletins. If Windows Update is set to Automatic Update, the latest patches will be automatically downloaded and installed without having users to do any specific actions. Users who don’t have Automatic Update enabled can check for the updates manually. If you want to update multiple machines, you can download the patches from Microsoft Download Center and deploy them. The July 2012 Security ISO will be available on Microsoft Download Center shortly. Microsoft will as usual host a webcast to address customer questions on the security bulletins on July 11, 2012, at 11:00 AM Pacific Time (US & Canada).